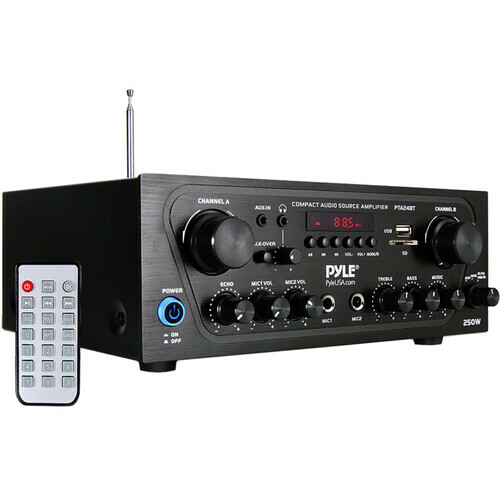 Enjoy music from your wired and Bluetooth-capable devices with the Pyle Pro PTA24BT Stereo Receiver. This 2-channel receiver produces up to 250W of total max power and is equipped with Bluetooth connectivity, allowing you to wirelessly stream music from compatible audio sources such as computers, smartphones, and tablets. A USB reader and SD card slot are also onboard, along with two stereo RCA inputs, a 3.5mm aux input, and two 1/4" microphone inputs. The integrated FM tuner allows you to enjoy free over-the-air content and store up to 30 stations. Box Dimensions (LxWxH) 20.3 x 12.5 x 11.5"